An-an, dan ji! Wey-wey, oh oh! The secrets of the spirit world reflect every corner of reality. Show respect to the spirits and they respond to your dances and songs. 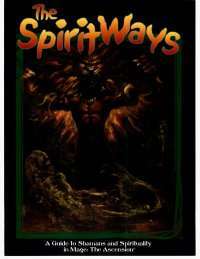 Bring reverence to the spirits and you may walk in their world. No mans flawed magick compares to the spirits, archetypes of all creation. Let the barriers between flesh and spirit fall away and answer the call of the world made whole. For shamans and spiritualists of all Traditions, the compromises, bargains and rituals of magick are rooted in ties between human and nature. See what awaits in the Mirror World with new Abilities, Merits and Flaws for shamanic characters, an in-depth look at shamanistic cultures across the world, and a host of spirits and their realms. Plus, fetishes, rotes and spiritual investments for truly devoted seekers.